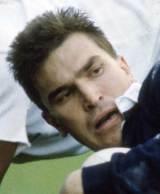 Tukalo made his Scotland bow against Ireland during the 1985 Five Nations Championship and would go on to earn a total of 37 caps in a seven-year international career that included two Rugby World Cups. He was part of the side that claimed a famous Five Nations Grand Slam in 1990 and the side edged out in the 1991 Rugby World Cup semi-finals by England and had notched 15 tries before his final international appearance against Australia in Brisbane in 1992. He later served as coach of club side Heriots RFC and combined work in the gas industry with a column for a Scottish Sunday newspaper.